This was taken in 2011 and is not the YouTube video in question. 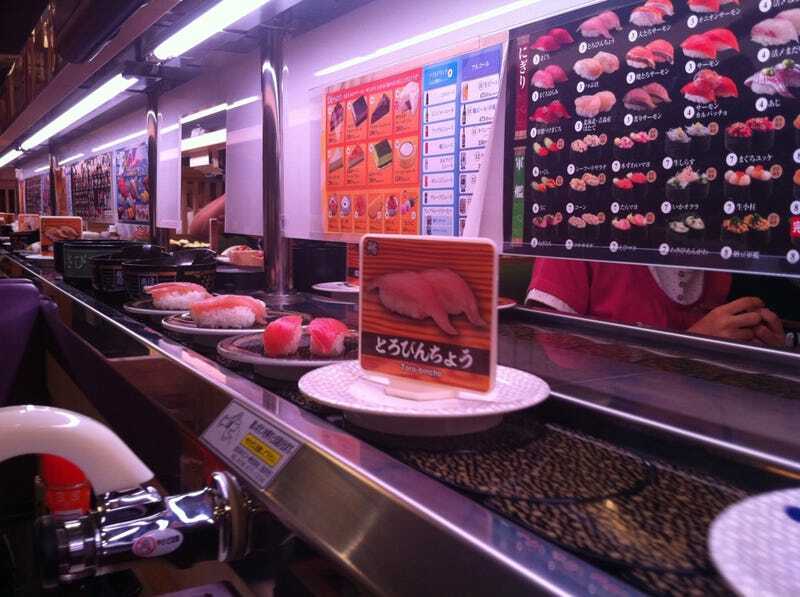 Earlier this month, Tokyo-based YouTuber TkyoSam put a GoPro on the conveyer belt at a Sushiro rotating sushi restaurant. The chain has issued an apology and is now banning photography in their restaurants. Sushiro is one of Japan’s biggest conveyor belt sushi chains. The incident has made national news. Kotaku sent longtime Tokyo resident TkyoSam an email for comment but did not hear back prior to publication. The original clip, which has since been taken down, showed TkyoSam placing a small camera on the conveyor belt. It made its way around the restaurant, clearly showing the people’s faces in different booths. Some surprised people noticed the camera and waved. Others appeared unhappy, and one customer stuck up his middle finger. Not everyone noticed it. The image has been edited by Kotaku for privacy. The restaurant staff discovered the camera and removed it from the conveyor belt in the back where the food is prepared and put it on the counter. The staff then apparently returned it to the YouTuber. In the original description, TkyoSam wrote that the staff didn’t get angry at him. But as YouTuber Gimmeaflakeman points out, the Japanese reaction in the YouTube comments revealed privacy and sanitary concerns. (Popular Japanese YouTuber Shibatar points out, it didn’t appear that TkyoSam made the clip with malicious intent. That, however, won’t abate those privacy and sanitary concerns.) The reaction among many English language commenters, however, was that the clip was cute or cool. The clip spread throughout the internet, getting featured on sites like The Daily Mail and Mashable. The seven-minute-or-so clip, which was posted on March 6, got over 500,000 views. By this morning, it had been taken down. In an official release, Akindo Sushiro stated that it never granted permission to film inside the restaurant. It then apologized profusely for any trouble the clip has caused. Moreover, Akindo Sushiro stated that the restaurant, including the rotating conveyor belt lane, had been cleaned and disinfected since the incident. The restaurant serves raw fish, and hygiene management is important. Akindo Sushiro added that currently, it is discussing the incident with law enforcement, including in relation to customer privacy. Because of the clip, Akindo Sushiro no longer allows filming or photography in its restaurants. Tourists visiting Sushiro might want to snap images to remember their meal or trip, but it sounds as though that is now prohibited. From henceforth, the company is also considering taking “severe legal action” against those who do similar stunts. A quick YouTube search pulls up other similar clips, which appear to be filmed by non-Japanese. If you are visiting or living in Japan, doing this isn’t recommended. The sushi, however, is.